Oh my goodness, I can't believe Easter is only three days away!? Somehow I didn't get into making many Easter cookies this year. Maybe because I made a crazy number of bunnies last year. Anyway, why should the bunny get all the love? Regardless, these little guys are cute and easy and great for the last minute! 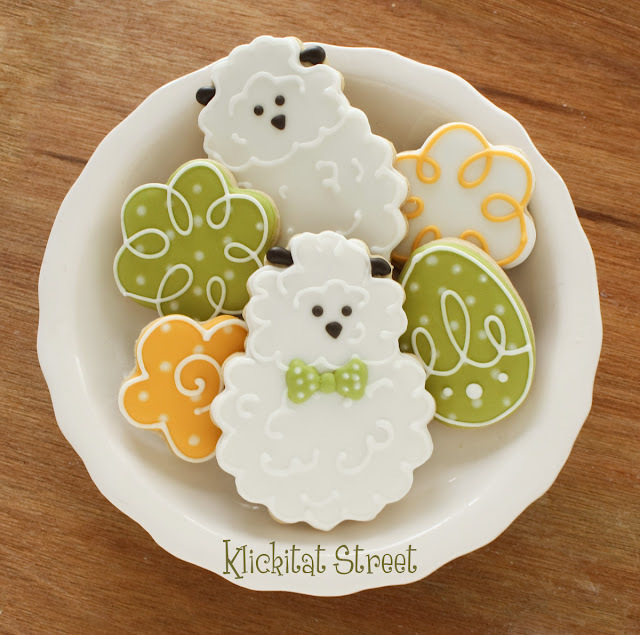 These little sheep are super simple and you can get by with only two icing colors! Start by piecing the two dough shapes together before baking. 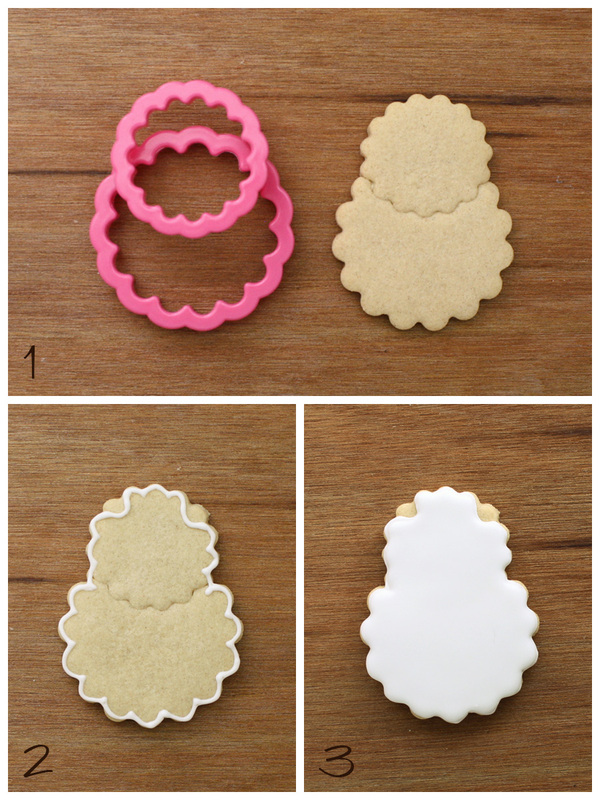 Outline the scallop edges with white icing leaving two gaps at the top for ears. Let the outline set up for a few minutes and flood in white icing. Allow the flood icing to dry for several hours or overnight. 4. Once the white icing is dry, pipe two little blobs with the brownish black icing for ears. Add eyes and a little nose too. That's it! Fast and easy and oh so cute. Of course a few bunnies might just sneak up on you too! I love these. I love sheep anyway, but these are too cute. I shall add them to my collection. Great tutorial! Sharon @The Plaid Cookie Co.
Oh my gosh...those, and all the rest of those little animals are so stinkin' cute! Love them! I always love your ideas, thanks for sharing! 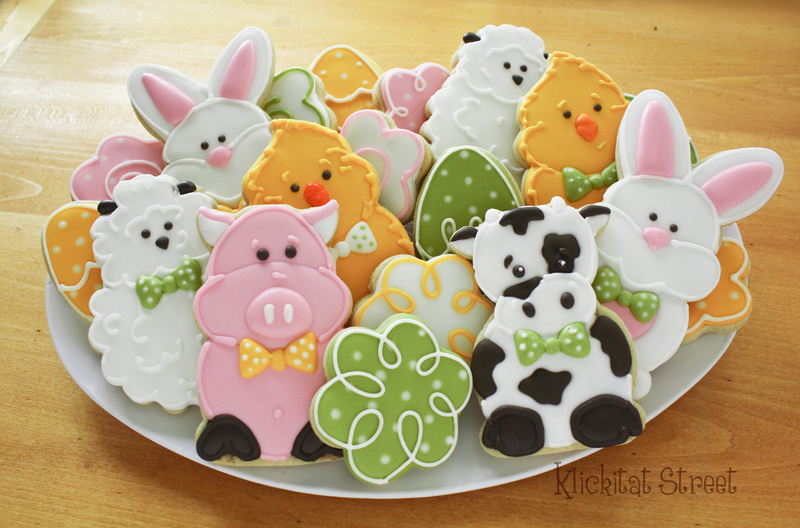 The entire plate of cookies is adorable!! You always have such great ideas!!! Super cute idea....Wish I could see what you see in a cutter!! The sheep are my favourite and I love how you created them with the scalloped cutters! i like your idea, thanks.